Despite what the know-it-alls on the message board are saying, the final of the Olympic steeplechase provided American distance running fans with a thrill. Four-and-a-half minutes into a race that was moving at a modest pace by world-class standards (2:46.97 at 1k), US Trials Champion Anthony Famiglietti, who had run a PR from the front in the semis to make the final, took the lead. Seeing a white guy in the lead of an Olympic distance final certainly energized the Danish announcers that were talking on the feed we were watching. Fam's lead would be short-lived, however, as less than a lap later he was falling off the main pack, which already had lost at least two competitors. The contenders were ratcheting up the pace, but it was clear that this race was going to come down to a frantic finish. Perhaps expecting a Kenyan sweep with 600m to go, Kenyan fans must have been a bit nervous as it was anyone's race. Heading into the bell, the Kenyan steeple fans probably relaxed a bit as defending Olympic Champion Ezekiel Kemboi and fellow Kenyan Richard Mateelong went to the front and were first and second. They were followed closely by France's Mahiedine Mekhissi-Benabbad. As the final lap progressed, it was the defending champ Kemboi (who had guaranteed victory earlier in the week when he said, "I must retain the title or I won't return home. Believe me, I will retain the gold medal. I am in the best shape of my life.") who faltered first. 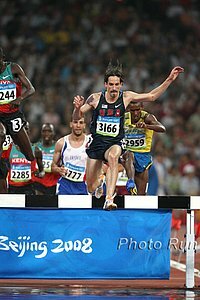 But as he fell back, his compatriot Brimin Kipruto, the 2007 World Champion, was moving up. Kipruto had run most of the race in the back of the lead pack and was only in the middle of the pack coming to the bell. Heading into the final turn, Mateelong and Mekhissi-Benabbad were joined by Kipruto, and heading into the final water jump, fans got an amazing spectacle - all three were running abreast. The Frenchman was sandwiched by Kipruto on his outside and Mateelong on the inside. It seemed someone was liable to go down, but no one did, and heading into the final barrier on the homestretch, the three were still side-by-side, providing quite a spectacle. A steeple doesn't get any better than this. Given how authoritatively he'd moved up throughout the final lap, it should have been no real surprise that Kipruto was the one who pulled away for the Olympic title, as the Frenchman Mekhissi-Benabbad got silver in a lifetime best of 8:10.49 and Mateelong held on for third (8:11.09). Kipruto's last lap was sub-60. Very impressive. Famiglietti ended up 13th in 8:31.21. Since Amos Biwott won the steeplechase gold medal for Kenya at the Mexico City Olympic Games in 1968, Kenya has taken the gold medal in this event every time the African nation has attended the Games. 3 Richard Kipkemboi Mateelong KEN 8:11.01 . 5 Bouabdellah Tahri FRA 8:14.79 . 7 Ezekiel Kemboi KEN 8:16.38 . 8 Abubaker Ali Kamal QAT 8:16.59 . 9 Benjamin Kiplagat UGA 8:20.27 . 10 Mustafa Mohamed SWE 8:20.69 . 11 Tareq Mubarak Taher BRN 8:21.59 . 12 Ion Luchianov MDA 8:27.82 . 13 Anthony Famiglietti USA 8:31.21 . 14 Ruben Ramolefi RSA 8:34.58 . Let's be honest, when this race started, most track and field aficionados were praying that a doped Russian wouldn't somehow win, given the fact that 7 Russians - many of them middle distance runners - were suspended just prior to the Olympics. Those athletes were basically going to make a mockery of the Olympic middle distance events on the women's side. If a Russian medalled here, the validity of that medal would certainly be under intense scrutiny. 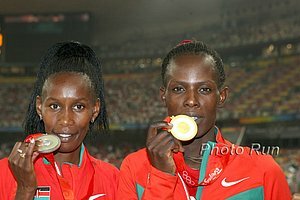 After the gun went off, all questions as to what tactics Kenya's 18-year-old sensation Pamela Jelimo would employ went out the window. She would do what she's done in every 800m race run she has ever run - hammer the pace from the front. Jelimo took the race out in a ridiculous 55.41. She was followed fairly closely by last year's World Champion Janeth Jepkosgei as Jamaica's Kenia Sinclair tried to keep pace about five meters back. Probably 10-15 meters off the lead was the great Maria Mutola and Russia's Svetlana Klyuka. For a brief moment, we thought, "Oh no, is 55.41 too fast? Klyuka's out in 57-58; could she swallow up the Kenyans?" No worries; as the leaders came to the backstretch, Jelimo did what she's done in every race this year - exploded. As she got to 600m in 1:24.03, the question turned to whether she could attack the world record. No world record scare, but she got a much deserved Olympic gold in a new personal best (and new world junior record of 1:54.87). Jepkosgei, who had looked no better than many of the other contenders all summer, finally displayed the kind of fitness she showed a year ago and finished a decisive second in a seasonal best of 1:56.07, with Morocco's brilliant championship racer Hasna Benhassi getting the bronze in another SB of 1:56.76. Klyuka ended up 4th in 1:56.94. Mutola, the 2000 Olympic Champion, ended her Olympic career in fine fashion with a seasonal best of 1:57.68, which placed her 5th. Kenia Sinclair also got a SB in 6th (1:58.73). 4 6 Svetlana Klyuka RUS 1:56.94 . 7 9 Yuliya Krevsun UKR 1:58.73 . 8 5 Tatyana Andrianova RUS 2:02.63 .